Stylish, clever and practical. If a gadget covers those three adjectives, it’s got a chance for success. 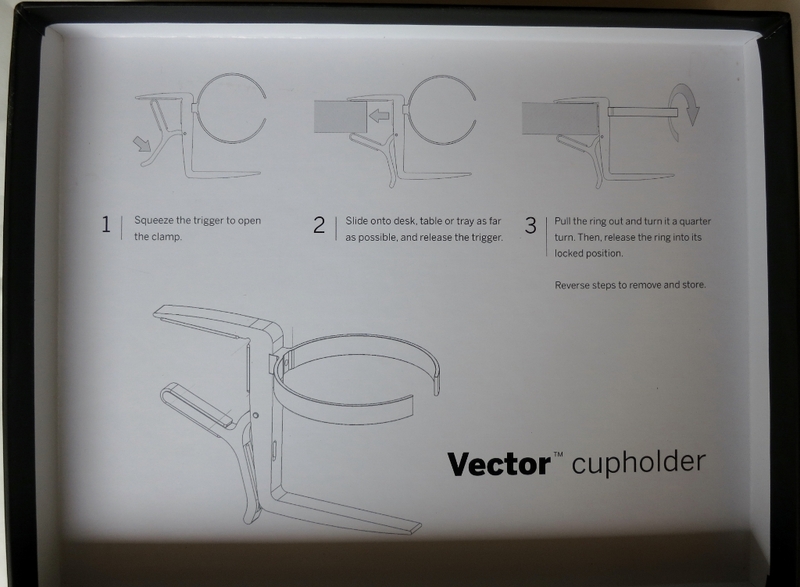 And those are the words that first come to mind for the Vector cupholder that I was fortunate to get my hands on. If you want to reduce your worry level about spilling a drink on your keyboard – whether at home, in the office, or in the air – read on. After carefully lifting the lid – this just isn’t a box you’d rip open – you find a curious aluminum contraption nestled in black foam. What is it? Well, that’s explained clearly and succinctly under the lid you just removed. So you pull the contraption out of the foam and immediately think two things: “very light” and “sharp edges.” Although the device is very solid, the aluminum keeps it light: 3 3/8 ounces. The machined edges are sharp, but more clean than dangerous. Now you want to squeeze the trigger and find a place to attach this baby. 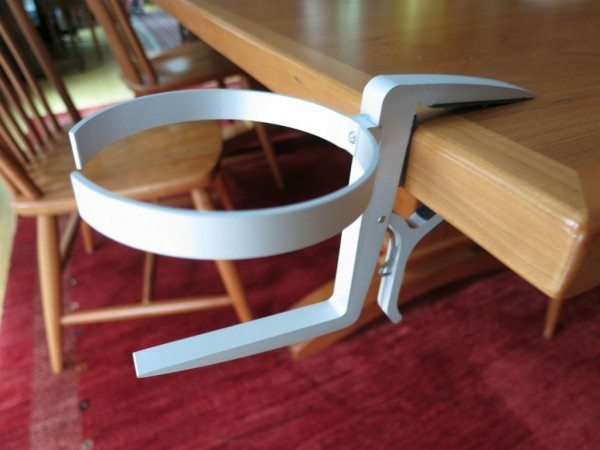 Just make sure that the table or desktop is less than 1 ½” thick. The table below is about an inch thick, and it worked fine on my 1 ¼” desk. The spring tension remains strong all the way to very thin surfaces. In fact, one recommended use is for airplane trays, which are always tricky when you’re balancing work and those flimsy, slippery plastic cups. 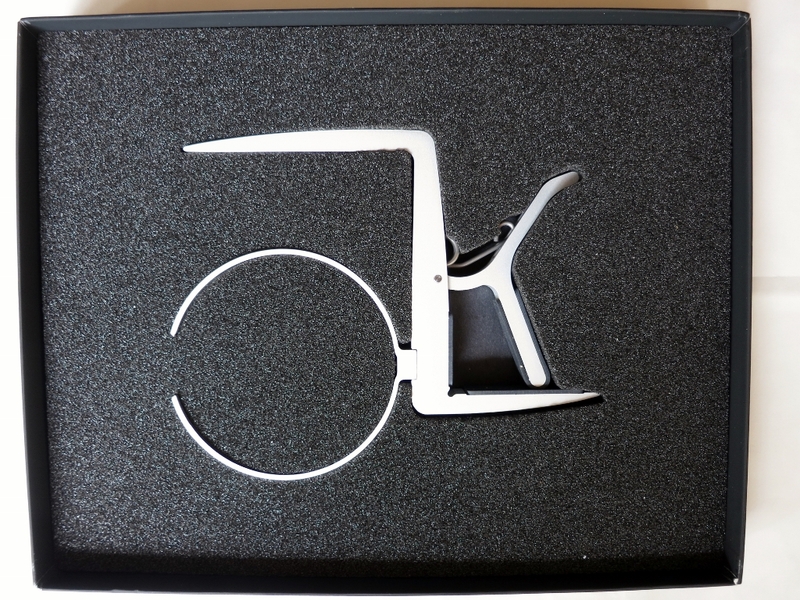 The cupholder loop is also spring-loaded. Simply pull it from the body and twist it ninety degrees into position. The quick and secure setup is the clever part of this gadget. Now you’re ready for your beverage, as long as you’re not using a mug with a diameter more than three inches. The cupholder loop has very little flex in it. 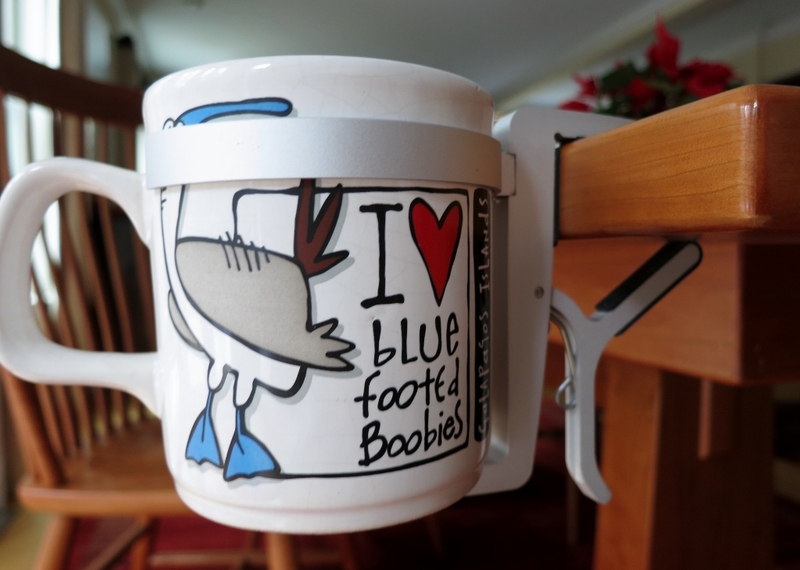 The mug in the photo below just barely fits, and I probably wouldn’t use it regularly because the sides could get scratched going in and out of the holder. 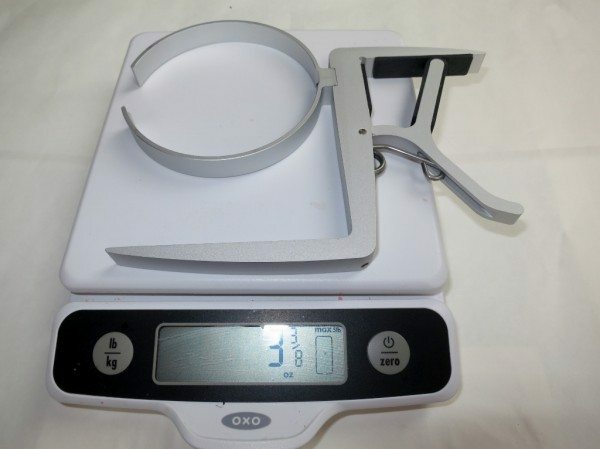 The next picture provides a closer look at the attachment mechanism. Each contact surface is covered with soft rubber to prevent scratches. The cupholder can be wiggled a bit from side to side, but it’s quite stable. The only real spill danger might be if the cupholder stuck out into a traffic aisle and someone brushed up against the mug hard enough to slosh liquid out. Even then, the danger should be more to the floor than your keyboard. Those popular tall travel mugs fit, also. Loosely, and looking a little top-heavy, but they won’t fall out. 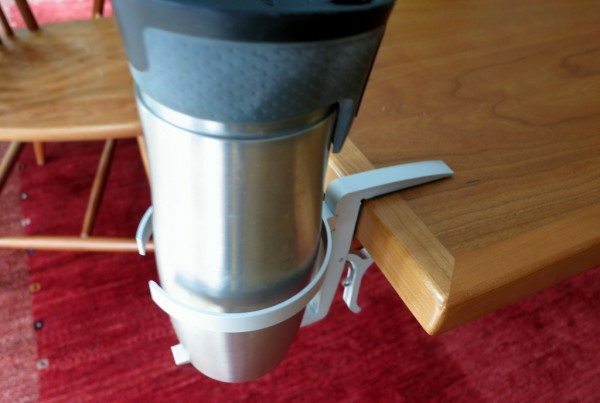 This cupholder could become a permanent fixture on your desk at home or in the office, but at least think about bringing it along on your next plane or train trip. After all, that’s why it was designed to fold flat and be lightweight. 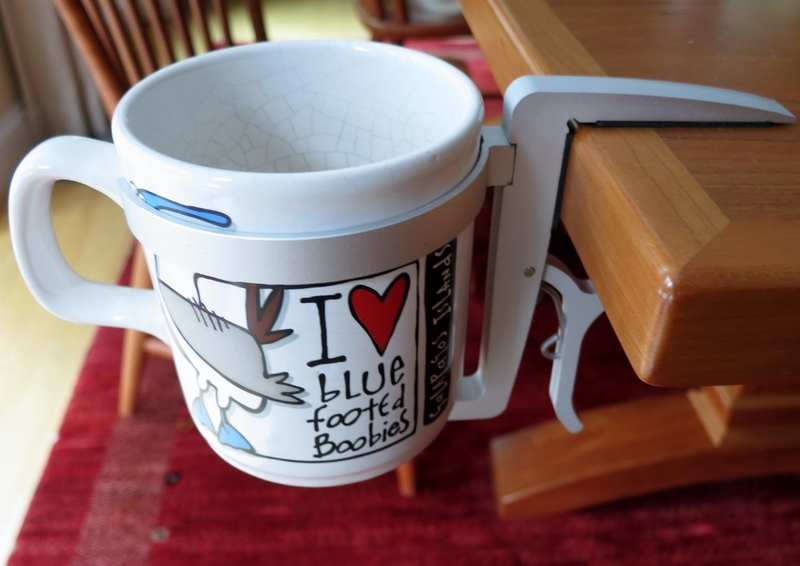 It will keep your drink off that tiny little tray with your expensive computer or tablet and at the same time hold it more securely. The cupholder loop is even designed to be just the right size to hold those plastic airline cups by the lip. 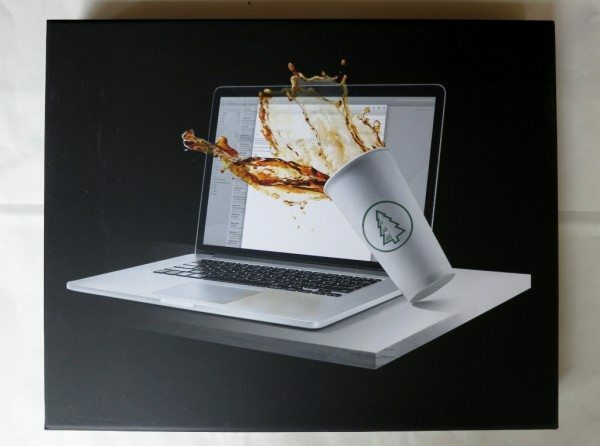 There’s a (professionally stylish, of course) photo of this on the product website. At $50, the Vector cupholder may not be an item that many people buy for themselves. But it is almost certain to be a much-appreciated gift. Source: The sample for this review was provided by Vector Werks, LLC. Please visit their site for more info about this product. 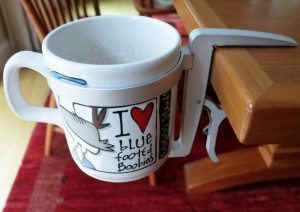 At $10 plus $4.50 shipping the drink clip cup holder would let me have three of them around the house without having to move them. And they come in all sorts of colors. I’m sure the Vector cup holder is a genius of design and engineering, but it’s got to come down in price. Yes it’s pretty, but for that price I would hope it came with an aged bottle of vodka. Do they age vodka? Guess I’m not in the “know” for booze. I like how you placed a spill-proof Contigo travel mug in the cupholder holder. However, it does clear space on your desk. @Ariel. 🙂 Yes, I was really just looking for a tall, narrow beverage holder to see how it would stand up. But it does clear space on a desk or, maybe more relevant, an airline tray. Those little quarter-inch divots on the molded trays do an almost fair job of holding airline cups, but not taller things. And if you’re trying to use a laptop computer, it usually covers that recessed area.